Bongos Salad ($7) Mixed Greens, Tomatoes, Onions, Cucumbers & Carrots topped with your choice of House Vinaigrette or Ranch Dressing. Bongos Salad with Shrimp ($13) Mixed Greens, Tomatoes, Onions, Cucumbers & Carrots topped with your choice of House Vinaigrette or Ranch Dressing. Bongos Salad with Chicken ($11) Mixed Greens, Tomatoes, Onions, Cucumbers & Carrots topped with your choice of House Vinaigrette or Ranch Dressing. Caesar Salad ($8) Romaine Lettuce tosse with Caesar Dressing, Croutons & Parmesan Cheese. Pineapple, Cantaloupe, Honeydew, Strawberry, Grapes topped with Raisins & grated Coconut, served with Coconut Sauce. PorkTamale ($8) Polenta Corn Meal laced with Pork & wrapped in a Corn Husk. Fried Stuffed Potatoes ($7) Fried Breaded Mashed Potato Stuffed with Cuban Creole minced Beef. Ceviche ($12) Marinated Fish in natural Lime Juice, Red Onions, Cilantro & Mild Jalapeno Peppers. “Bongos Combo” (Serves 2 People) ($21) Fried Stuffed Potatoes, Pork Tamale, Cuban Mojo Marinated Fried Pork Chunks, Traditional Cuban Ham Croquettes, Stuffed Plantain Cups. Served from 11:00am to 4:00pm. All sandwiches are toasted, pressed and served with French fries. Cuban Sandwich ($8)- Roasted Pork, Ham, Pickles Swiss Cheese, Mustard & Mayo on Cuban Bread. Midnight Sandwich ($8)- Roasted Pork, Ham, Pickles, Swiss Cheese, Mustard & Mayo on Sweet Egg Dough Bread. Cuban Style Steak Sandwich ($9)- Thin Cuban Steak with Grilled Onions, Lettuce & Tomatoes served on our delicious Cuban Bread. Cuban Club Sandwich ($9)- Ham, Turkey, Bacon, Swiss Cheese, Lettuce, Tomatoes & Pickles. Chicken Sandwich ($8)- Cuban Style Shredded Chicken Breast topped with Lettuce & Tomato. Kids menu available for 12 years of age or under. All Kids Menu items are served with French Fries or Mixed Vegetables. Grilled Fish Fillet ($20)- Grilled Filet of Fish seasoned with Garlic & Olive Oil served with White Rice & Fried Green Plantains. Fish Bites ($18)- Lightly Floured & Deep Fried Fish Bites Marinated in Cuban Mojo served with White Rice & Maduros. Fish Cuban Creole ($22)- Fish Bites cooked in our Homemade Cuban Creole Sauce served with White Rice & Maduros. Shrimp Cuban Creole ($23)- Shrimp cooked in our Homemade Cuban Creole Sauce served with White Rice & Fried Green Plantains. Shrimp with Garlic Sauce ($23)- Shrimp sauteed in our Homemade Cuban Garlic Sauce served with White Rice & Fried Green Plantains. Bongos Famous Shredded Chicken Breast ($16)- Cuban Style Fried Shredded Chicken Breast Topped with Grilled Onions served with White Rice & Maduros. Grilled Chicken Breast ($14)- Grilled Chicken Breast Marinated in Garlic & Lemon Topped with Grilled Onions served with White Rice & Maduros. Cuban Style Breaded Chicken Breast ($15)- Breaded & deep fried Chicken Breast served with White Rice & Maduros. Cuban Style Milanese Chicken Breast ($15)- Cuban Breaded Chicken Breast topped with Marinara Sauce & Melted Mozzarella Cheese served with White Rice & Maduros. Bongos Famous Roasted Chicken ($14)- Bongos Seasoned Roasted Half Chicken marinated in a Lemon Juice, Garlic, White Wine & Light Tomato Cuban Creole Sauce served with Moro Rice & Maduros. Chicken Bites ($14)- Lightly Floured & Deep Fried White Chicken Bites Marinated in Cuban Mojo served with White Rice & Maduros. Chicken with Yellow Rice ($14)- Quarter Chicken Breast cooked & served on a bed of Yellow Rice & Maduros. Bongos Famous Fried Rice ($16)- Fried Rice with Shrimp, Beef, Chicken, Vegetables, & Fried Sweet Plantains. Cuban Fried Rice with Chicken ($15)- Special Vegetable Fried Rice with Fried Sweet Plantains topped with Fried Boneless Chicken Chunks served with a Sweet & Sour Sauce on the side. Bongos Famous Fried Shredded Beef ($16)- Cuban Mojo Marinated Fried Shredded Flank Steak topped with Grilled Onions served with Moro Rice & Maduros. Cuban Style Steak ($17)- Thin Tenderized Steak seasoned with Garlic Salt & Mojo topped with Onions & Parsley served with White Rice & Fried Green Plantains. Cuban Style Milanese Steak ($19)- Cuban Breaded Steak topped with Marinara Sauce & Melted Mozzarella Cheese served with Moro Rice & Maduros. Shredded Beef ($16)- Shredded Beef in a light Tomato Cuban Creole Sauce with Onions & Peppers served with White Rice & Maduros. Cuban Style Skirt Steak ($23)- Tenderized Skirt Steak Grilled to perfection and served with side of Chimi-Churri Sauce served with White Rice & Fried Green Plantains. Roasted Pork Loin ($18)- Pork Loin seasoned with Lime, Garlic & Oregano topped with Onions served with Moro Rice & Maduros. Bongos Famous Masitas de Puerco ($17)- Cuban Mojo Marinated Fried Pork bites topped with Grilled Onions served with Moro Rice & Maduros. Pork Chops topped with Grilled Onions ($16)- Grilled Pork Chops Marinated in Garlic topped with seasoned Grilled Onions served with Moro Rice & Maduros. Cuban Creole Minced Beef ($14)- Cuban Creole Minced Beef with Onions, Peppers & Olives served with White Rice & Maduros. Cuban Creole Minced Beef with Eggs ($15)- A Caballo Cuban Creole Minced Beef topped with Fried Eggs. Cortadito ($2.75)- Steamed Milk with a Shot of Espresso topped with Frothed Milk. Cafe Con Leche ($3)- Steamed Milk with Espresso Coffee. Rice Pudding ($5)- Traditional Cuban Style Rice Pudding. Traditional Cuban Flan ($5)- Traditional Cuban Style Custard topped with Caramel. Cheese Flan ($5)- Traditional Cuban Style Custard made with smooth Cream Cheese topped with Caramel. Three Milk Cake ($6)- Mixture of Sweetened Condensed Milk, Evaporated Milk, & Heavy Cream poured over the cake until its dripping. The cake is then topped with Merengue Frosting & a Cherry. Bread Pudding ($6)- Bread Pudding served with a side of delicious Caramel topping. Vanilla Custard Pudding ($5)- Cuban Style Sweetened Vanilla Pudding. Guava Shells ($5)- Guava Shells served with Smooth Cream Cheese. Guava Shells with Toasted Shredded Coconut ($7)- Guava Shells served with Smooth Cream Cheese. 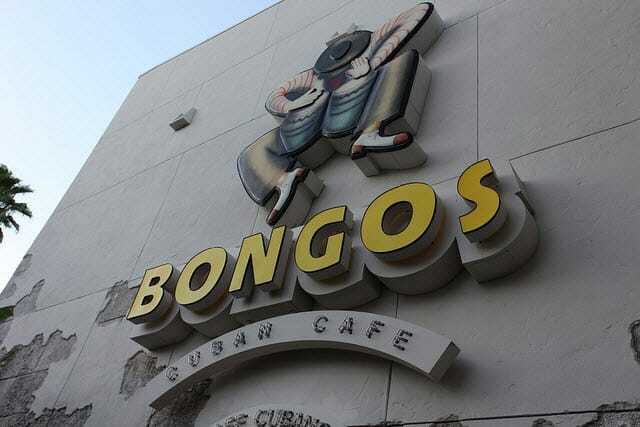 A Bongos Cuban Cafe Exclusive.